RSS – Sign Up Here! For us, Deja Entendu holds a special place in our CD collection. The 2003 release from Long Island band Brand New, who’d previously been known for pop punk fare like “Jude Law and a Semester Abroad,” made us reevaluate the depth to which bands could plunge to come up with art of “true substance.” In quite a few cases we “re-listened” to bands that were often brushed off as nothing more than purveyors of saccharine superficiality to find that they were capable of profound insights just as relevant as those “more serious” artists. Since that time, Brand New has become quite a “serious” band who is able to maintain their listenability while occasionally hinting at their pop sensibilities. 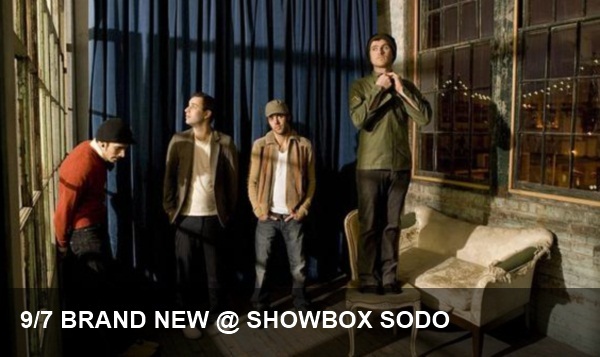 Whether you’re an old fan or a new listener, you’ll no doubt enjoy their sold out show in SoDo tonight.